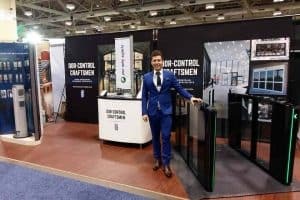 Over 30,000 industry professionals attend The Buildings Show, North America’s largest networking and educational event for design, architecture, construction and real estate. Automatic door operators are electronic devices installed at the top of your door. They allow a door to open automatically without doing any physical work. Automatic Door Operators are also known as Swing Door Operators. Benefits: Professional, convenient for customers, help save energy, meet AODA compliance & Ontario’s Building Code. Automatic sliding doors are flat glass panels that slide horizontally. They include sensors, so they open automatically when people walk up to the entrance. 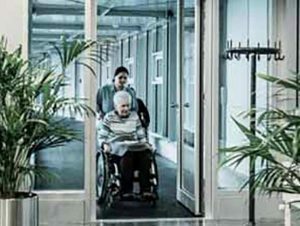 Benefits: Professional, convenient, wide opening allows for increased traffic flow and large items to be moved in and out, help save energy, meet AODA compliance & Ontario’s Building Code, and save space. 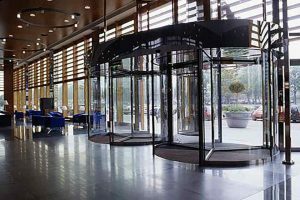 Revolving Doors are prestigious, elegant and reduce heating and cooling costs for a building. Manual, Automatic, DuoTour Revolving & Sliding Door all in one and TwinTour Revolving Doors. Benefits: Provide climate control, traffic control and keep debris, moisture and snow out. They allow large numbers of people to pass in and out. Also provide power assistance, automatic security locking, and access control systems. 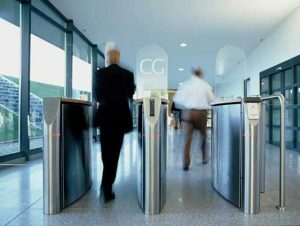 Security Entrances & Optical Turnstiles manage the movement of people into buildings with varying degrees of security by connecting with access control and visitor management systems. Optical turnstiles, security portal doors, full-height turnstiles and revolving security doors. Benefits: Provide security, access control systems, controlled traffic flow, program who is allowed in with a card or biometrics, and deter unauthorized access, crime and theft. We have many years of experience and a reputation for integrity. 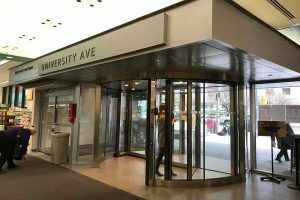 We can help you choose the best entrance for your facility in Ontario and all major cities across Canada. We design and customize your entrance to meet code and your business needs. 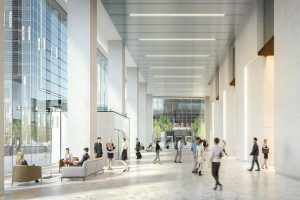 Meet AODA compliance, provincial Building Code, improve accessibility and traffic flow, save the cost of energy, secure your entrance. Make your entrance architecturally beautiful to enhance your facility. All installations are by AAADM certified technicians with many years of experience. We have high standards for service and safety and a reputation for excellence. Dor-Control technicians are up to date with the most comprehensive safety regulations. 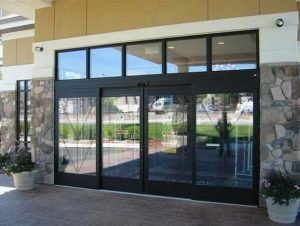 Our goal is to to make sure your automatic doors & security entrances are safe and reliable for your customers and employees. We have emergency 24/7 service available in Southwestern Ontario. Service trucks are always fully loaded with the hardware required to make same day repairs. Book regular scheduled maintenance to help keep your business flowing smoothly with a Preventative Maintenance Plan. 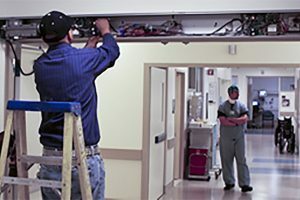 Regular scheduled maintenance helps prevent breakdowns and failures of your automatic door system. Invented in 1954, first one was installed in 1960. Motion detector activation became standard on sliding doors in the 1980’s. 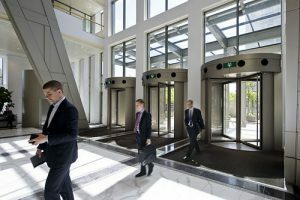 Manual revolving doors were invented in 1800’s but not automated until the 1950’s. Invented in 1990’s as a result of a law for barrier-free travel into buildings. Dor-Control Craftsmen has been proudly serving Ontario and cities in Canada since 1967. Regardless of the industry, size or complexity, we always bring the same passion and commitment to every project we take on. We provide the knowledge and expertise to help you achieve your vision and goals. From design-assist to delivery, construction engineering to service – we are with you every step of the way. We are a family-owned business, and when you do business with us, you can trust our integrity and reputation for excellence. During the past 50 years we have been dedicated to providing professional and complete service. We have 24/7 service available. Door technicians are AAADM certified, professional and reliable. We adhere to the highest safety standards outlined by the Ministry of Labour. We are bonded and fully insured. Dor-Control Craftsmen has installed more than 100,000 entrances for businesses since 1967. We have the knowledge, expertise and capabilities to help you achieve your vision, values and goals. Strong relationships with all of our suppliers and service providers, provide you with a strong network of support and collaboration. Continuing education and attending tradeshows keeps us at the top of our game. Take a look at some of the fantastic projects we have been a part of. We can help you create a beautiful and welcoming entry. 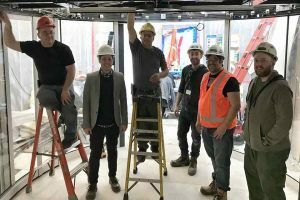 The staff at Dor-Control Craftsmen were a great help with choosing the right Automatic Sliding Door Package for my main entrance. The product supplied looks great and was installed by very professional staff. Dor-Control recently installed Optical Turnstiles at a number of our entrances across our property and did a great job! The sleek look of the entrance and the professional team Dor-Control sent to install the entrance made a great impression with our owners! Thank you for your great work! 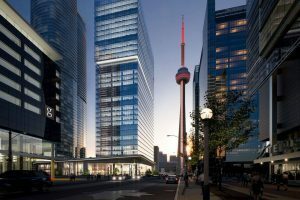 Dor-Control Craftsmen did a fantastic job at installing Automatic Operators on all of our buildings across Toronto. The staff was very helpful in selecting the correct application for our entrances.